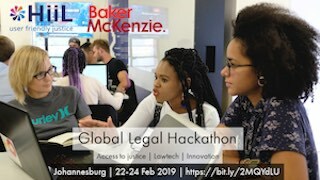 The Hague Institute for Innovation of Law (HiiL) and leading global law firm Baker McKenzie are delighted to announce that Global Legal Hackathon is returning to South Africa this February. Participants can arrive with an idea and a ready made team prepared to prototype your product, or simply come along with an open mind and a willingness to take part. Global Legal Hackathon Johannesburg will take place from Friday 22 February to Sunday 24 February at Baker McKenzie’s office in Illovo, Johannesburg. To register for the event and find out more, visit this address: https://glh.hivebrite.com/events/13594.